Whether it’s his unconventional physics-based swing, one-length irons, or vector putting technique, Bryson DeChambeau is always looking for a scientific angle to give him an edge on the competition. And judging by his breakout campaign last season, there might just be some merit to his approach. Sometimes, the tactics don’t go over so well, or they are deemed illegal by the USGA, like when the organization deemed his side-saddle putter to be non-conforming in 2017, or when they barred him from using compasses as reference tools last season. This season, DeChambeau has yet another strategy tucked up his sleeve -- he’s going to leave the flagstick in the cup when he is putting. 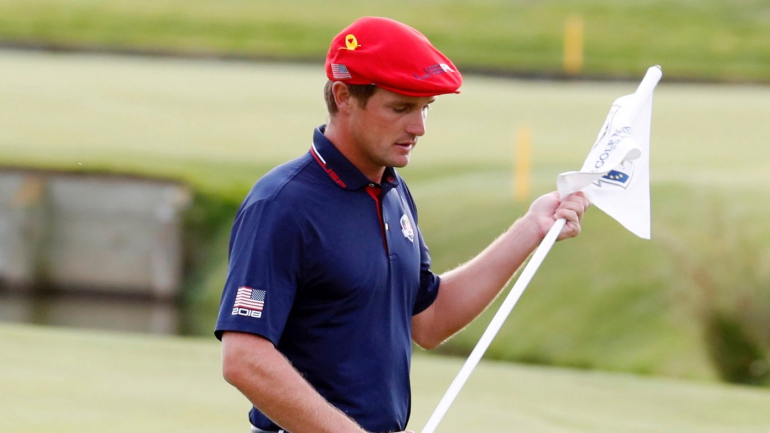 The USGA’s new rule changes will allow for this technique and DeChambeau is convinced that he will make more putts by doing so, although he won’t be doing it at every tournament. “It depends on the COR, the coefficient of restitution of the flagstick,” DeChambeau told Golf.com. “In U.S. Opens [where the flagsticks are notably thicker] I’ll take it out, and in every other Tour event, when it’s fibreglass, I’ll leave it in and bounce the ball against the flagstick if I need to.” DeChambeau ranked 41st overall in strokes gained with the putter last season, which is not shabby, but certainly leaves some room for the 25-year-old to improve upon. If this tactic does help him hole some more putts, we see not only DeChambeau’s stock rising even further but also a general flagstick-in movement emerging in amateur golf as a result. With three finishes of T15 or better already this young season, including last week at the Shriners, it appears that Harold Varner III’s game is finally back on track. The 28-year-old had a rollercoaster season in 2018, missing seven cuts in his first 17 starts before finally turning things around with a T7 at the Players Championship in May. The result sparked a mini-momentum shift for Varner, who went on to finish tied for 5th at the Greenbrier, solo 6th the following week at the John Deere Classic and tied for 17th at the RBC Canadian Open two weeks after that. Heading into the Wyndham Championship in August, the long bomber actually looked like a solid long shot bet for the FedEx Cup playoffs. However, Varner cooled off considerably in the season’s final event, finishing 14 shots back of the winner, and then took a first-round exit in the playoffs with a T40 at the Northern Trust. Even though he finished under par in both of those events, he just didn’t look like the same cool and confident Harold Varner III that we have grown accustomed to—and now we know why: he was playing with new clubs! Prior to the Shriners, Varner revealed that his shafts had gotten bent on a metal latch in his girlfriend’s trunk, while the two were driving to the Wyndham Championship, which forced him to assemble an impromptu set of clubs at the 11th hour. “My 7-iron and 4-iron got stuck in there; I didn’t know it. I get my 4-iron out and it’s like bent,” Varner said. “I pull out my 5-iron it’s bent, too! What the? So I had to get a new set.” The good news is that Varner looks like he has gotten used to his new clubs and is starting to look like himself again. Through three starts, he is ranked 14th in strokes gained tee to green and 2nd in strokes gained around the green. This poor guy went into full Jedi-mode, wielding his two irons like a couple of lightsabers, after a pair of aggressive geese targeted him with a relentless assault from the sky. Fortunately for the birds, his Jedi skills were poor…very poor. As if that net was going to contain his flop shot in the first place. Fore!! !